At our Berwyn counseling office, we have been hearing all about New Year’s resolutions. By now, you may already have broken the resolutions you set for 2018. Whether you want to lose weight, start exercising, stop smoking, or alter other behaviors, you may be angry with yourself and lack confidence in your willpower and dedication . Why Don’t We Follow Through on Resolutions? Change is stressful, even when it’s desired. Our brains only can handle a finite number of changes before we start to feel overwhelmed and paralyzed in our ability to follow through. When you tell yourself that you’re going to break habits and become a different (more perfect) person, your brain goes into overload, leaving you unable to follow through on anything. All-or-nothing thinking is a prime saboteur of change. You know how it goes: once you eat that first, forbidden treat, you tell yourself you’ve blown it for the day. You give yourself permission to continue, and promise yourself that you’ll change tomorrow. Except, you don’t. Sometimes, unhealthy habits develop as a way of managing underlying problems. This is called secondary gain, and refers to reasons to maintain unhealthy patterns. For example, people often turn to drugs and alcohol to cope with depression, trauma, or other mental health issues. Excess weight can serve as a barrier to physical and emotional intimacy. Staying in a bad job or relationship can protect from fear of failure. 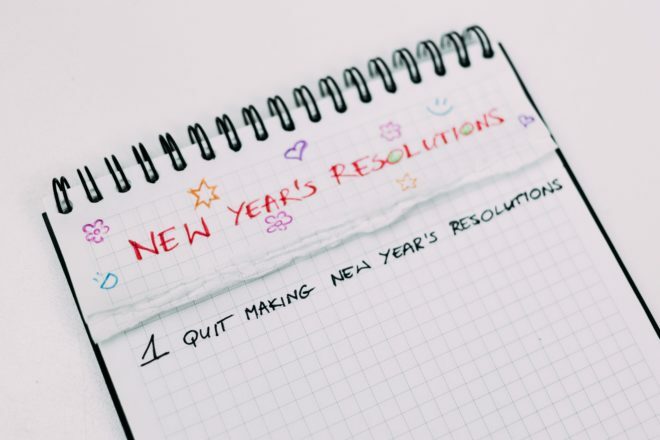 You are most likely to maintain your resolutions if you make them specific, and break them into small, manageable steps. Instead of promising yourself that you will lose weight, develop a food plan that you can follow. A nutritionist can help you, if needed. Rather than saying you’ll cut back on your drinking, you may decide to limit yourself to two drinks, two nights per week. Soon, later, and someday are not dates found on your calendar. Choose a day to start implementing the changes, and put it on your planner. External accountability is your friend. While step trackers benefit some, other people do best with personal interaction. Ask a friend, family member, or other support person if you can send a daily email letting them know how well you met your daily goal. One day at a time is not just for recovering alcoholics. As they say in 12-step, you only have to do for a day what you don’t think you can do for a lifetime. Embrace your screw-ups! Skipping a workout, eating a dish of ice cream, or taking a day off from looking for a new job doesn’t scream failure; it proves you’re a real person with many kinds of needs. The part you fight will grow stronger – try giving yourself permission to enjoy the break instead of berating yourself. You may benefit from working with a counselor. The therapists at the Couples and Family Wellness Center can assess for underlying, treatable mental health problems and help you uncover secondary gain that keeps you stuck. Together, we can develop goals that are achievable, and support you on your journey. If you are ready for change, make scheduling an appointment with us at our center in Berwyn your first goal of the new year. next post Could Your Child Have an iPhone Addiction?